The Only Home in the Daintree/ Cape Tribulation Area With Your Own Natural Swimming Hole & Waterfalls Right Off Your Verandah. 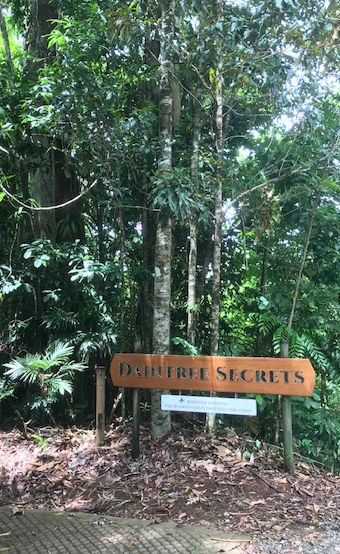 Daintree Secrets is your own private waterfall sanctuary set in the heart of the beautiful Daintree Rainforest, the oldest rainforest in the world! Only two hours scenic drive from Cairns, this secluded property captures the true essence of this spectacular wilderness. 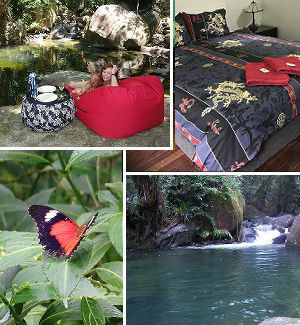 Daintree Secrets is uniquely situated over Little Cooper Creek with a series of waterfalls and large natural swimming hole right off your verandah. Set on four acres, this private sanctuary is powered by our own hydroelectric system, ensuring your carbon footprint is minimal whilst enjoying your stay in the middle of the oldest rainforest in the world. 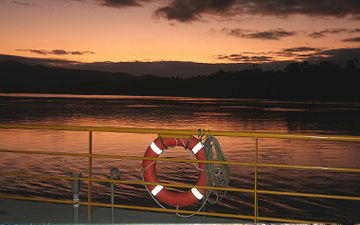 Centrally located in the Daintree / Cape Tribulation area, it is the perfect base to explore all the region has to offer. To ensure you make the most of your stay, we recommend a minimum of 3 nights stay so you can really relax and enjoy your own private waterfall sanctuary and explore all that this area has to offer. All our guests tell us that their stay just wasn’t long enough. To ensure yours is, we would like to offer you a FOURTH NIGHT FREE OF CHARGE if you book directly through our website. We look forward to sharing our beautiful and unique piece of paradise with you. Feel free to contact us with any questions you might have. 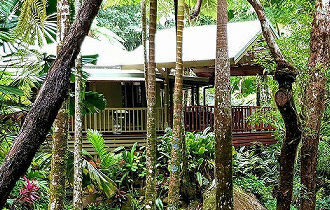 What Makes Your Stay at Daintree Secrets so Special? Set on four acres, in a valley just below Thornton Peak (the 3rd highest mountain in Queensland) you have absolute privacy and serenity. You have the entire property to yourself. Year round running stream means we can run our own hydro-electric power, not generators like all other guest-houses in the area. Other swimming holes dry up in the dry season. Our waterfalls run all year, providing the perfect mountain stream for you to enjoy. The largest private swimming hole in the area - approximately 15 x 10 metres, and 4 metres deep. Perfect for diving into! A smaller, shallow, sandy pool right below the verandah is perfect for those that cannot swim and it is warmer than the large pool. 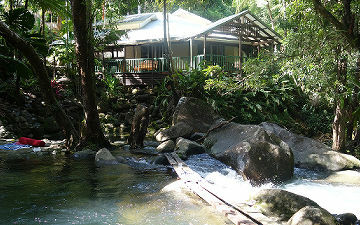 Our swimming holes are at the end of your verandah, not a 20 minute walk, and they’re all yours. You don’t have to share with the general public. The house sleeps 6, with a roll-away bed for an extra child. A viewing platform with table and chairs, looking down over the house and the creek. A sunny spot for sun worshippers and fabulous spot for early morning yoga. Please see a list of the features of the house under “Stay”. The kids absolutely loved swimming, rock hopping and playing on the mahogany floors. Mum & Dad loved sipping gin and tonics on the deck, playing canasta with Nanna, exploring with the kids and maybe an occassional late night skinny dip! We'll be back! The swimming hole is sensational. We had a lovely time staying at this beautiful place.